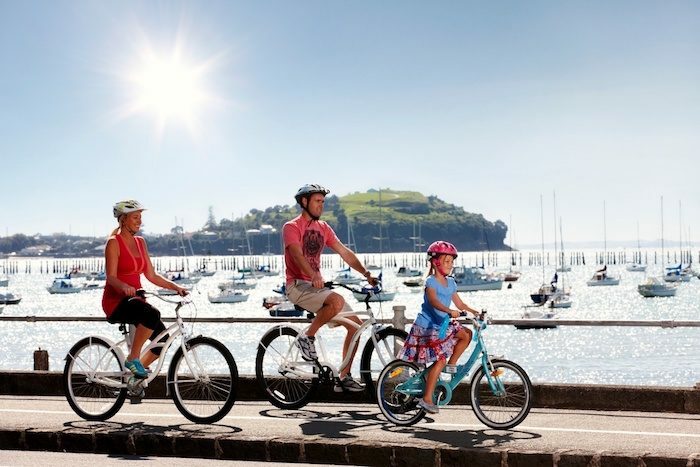 The pristine walking and cycling path along Tamaki Drive delivers striking views of the city skyline from across the bay as well as sections of sweeping beach. It’s the most centrally located, spectacular run in Auckland. Start out at Dove-Myer Robinson Park in Judges Bay (where you can literally stop and smell the roses at a huge heritage garden), then follow Tamaki Drive as it runs across the water and winds around Okahu Bay, MJ Savage Memorial Park, Mission Bay, and finally St. Helier’s Bay. St. Heliers, at the end of the line, is a great spot to relax with a post-workout treat. You can drop down to the beach in some sections, such as Mission Bay and St. Heliers for a jaunt on the sand, though the path is pretty sweet, too. Buses run regularly between downtown and St. Heliers, so it’s easy to do a one-way run. Note: that the Tamaki Drive walkway is shared by cyclists and rollerbladers, the latter of which local runners say can be particularly aggressive.